This mod changes how items 'burn'. Only items or block which can burn will burn in lava or fire. A piece of coal, a pickaxe, a piece of cobblestone and a wooden plank were throw into lava and the pickaxe and the cobblestone didn't burn. No item will be destroyed by a cactus anymore. InsanePower236 did an awesome job and added itemphysic to vanilla minecraft using one command. The command can be found here. Just place a command block, paste the command and apply a redstone signal. You are free to use this mod in a modpack after you have send me a pn . Please report me all bugs and errors to make this mod better . cool mod! will you update this in the future? Yes, i will release the Full version of it very soon. In the past this mod was a part of RandomAdditions so the coding is already done, i only have to update it :). So finally 0.8.1 is out. Fixed server not working bug. I agree with this. Broken download links are not good. Downloaded and installed. Seems to work nicely no crashes or fps decrease. Do you plan on adding support for the rest of the items? I noticed a lot of items did not have ItemPhysic applied. This would be A+ if it worked for all items, including 3rd party mod items. cool mod... I just don't get why a pumpkin wouldn't burn... its organic, it will eventually dry out and burn..
What vanilla items don't work? I can't support mods, because they are sometimes using their own renderer. any luck on that bug??? Let me what happening ok??? There are a lot of vanilla items that aren't working for me. I didn't show them all in the video. I changed setting to "fancy" and still not working. That's wired :o, does it work for blocks? 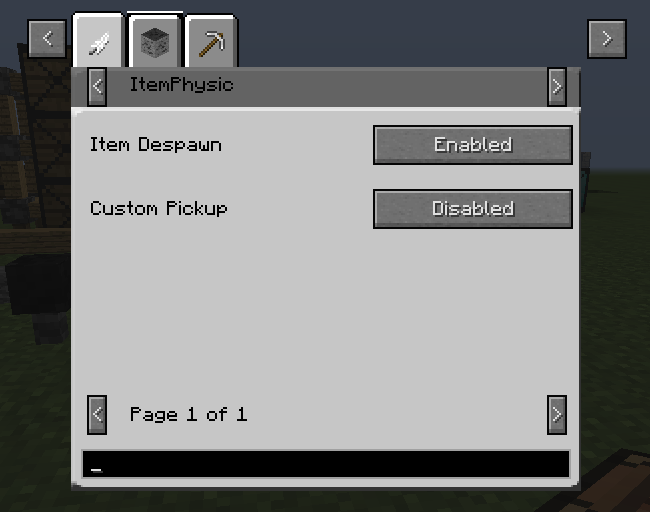 If you are using optifine you have to set "dropped items" setting to fancy.